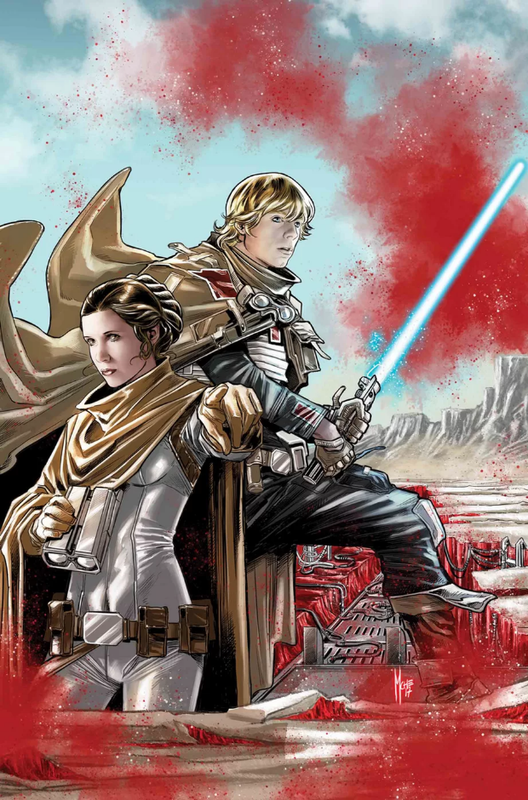 Star Wars: The Last Jedi – Storms of Crait #1 is kind of an odd one shot. On one hand, it’s got great artwork, a fun, action packed story, and it features the planet Crait from The Last Jedi. On the other hand, some of the artwork is distracting, some of the story is confusing, and at least of the moments was very out of place. It’s got some good points, and some bad points. On the good side, most of the artwork is great. Some of the characters likenesses are spot on, and the photorealistic faces blend in with the rest of the artwork. However, sometimes the faces are off, which can be a little distracting when they were so spot on in other panels. Oddly enough, Luke starts off completely off, and looks nothing like he does in the films until almost the end, where he looks spot on like Mark Hamill in the films. Han starts off looking exactly right, and then goes back in forth with looking on and off. Leia, on the other hand, looks great in all her shots, except for a few where her picture perfect face just doesn’t seem to have the right expression for the scene. Keep in mind it looks just like Carrie Fisher, it just doesn’t have the right expression for what’s going on. So throughout, there’s some of that oddness going on with the artwork looking straight up awesome, or perhaps just a little weird. In the end, it balances out positive, but it’s not perfect. The story, for the most part, is pretty good. The Rebellion starts off being chased by the Empire and jumping to find a safe place. Leia suggests Crait and Mon Mothma agrees to let her scout it out. They have a contact there that they want to see is trustworthy. He isn’t. This leads to Scar squadron showing up, and there’s a big battle. There’s also a lot of unanswered questions as to the fate of Scar squadron as the comic’s artwork leads one to believe that Sgt. Kreel died in battle against Luke, and Red Squadron did some straight up primitive murdering of the rest of the squad. But there’s a weird line at the end saying that Scar squadron managed to limp away with their lives, which doesn’t make sense. Up to that point, it looked like Scar squadron was wiped out. Did they live or did they die? My only other gripe is a weird scene with Wedge. I think they may have gone a little too far with it. The story has Wedge and the rest of Red Squadron engaging with Scar squadron in some hand to hand combat. Wedge picks something up and starts bashing a bad guy to death, all the while screaming about how you best bring a Star Destroyer if you want to stop Wedge Antilles. It’s was a bit much. Kind of cool, but not really fitting with the character. With some hits and misses, Storms of Crait is an interesting one shot that’s still worth checking out. It’s not earth shattering, and doesn’t add too much to The Last Jedi, but it’s a fun little adventure. I give it a four out of five metal bikinis.